New Delhi: Nepal says the Kosi flooded because India ignored its suggestion on constructing an upstream barrage on the river at Chatra. Chatra, in Nepal, is around 50km from Bhimnagar, where India built a barrage in 1954. Khoma Raj Dahal, deputy director general at the department of water induced disaster prevention, under Nepal’s ministry of water resources, said: “India did not construct it (the barrage) at Chatra due to the fear of the Nepal government creating problems for the downstream areas by leveraging the barrage." “India had psychological problems with Nepal... There is no change in the thinking even today," he said. Dahal added that he held the Indian government, and not the government of Bihar, responsible for the floods that caused large-scale destruction in various parts of Bihar and Nepal. “Kosi barrage is the responsibility of the Central government as the Kosi agreement was signed between the Central government of India and the Nepal government. According to us, the Bihar government is not in the scene." Umesh Narain Panjiar, secretary in India’s water resources ministry, refuted the charge. 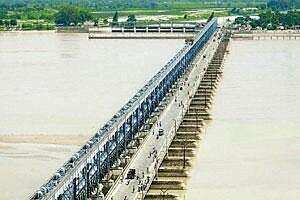 “The present Kosi barrage was constructed as per the India-Nepal Kosi agreement. The Chatra barrage was linked with the high Kosi dam in the Sapta Kosi project. There wouldn’t have been an independent Chatra barrage." The issue is likely to crop up at the meeting of the India-Nepal joint panel on water resources to be held in Kathmandu on 28 September. The meeting is expected to focus not only on various outstanding projects, but also on ways to control floods on both sides of the border. The meeting, to be attended by the water resources secretaries of the two countries, will look at ways to speed up work on the Pancheshwar project, the Sapta Kosi project, the Sun Kosi diversion scheme and the Naumure hydropower dam, a government official said, requesting anonymity. Apart from preventing floods, the Sapta Kosi, Sun Kosi and Pancheshwar projects will also serve India’s cause in the areas of power generation and irrigation. Nepal has said the Kosi river might change its course further eastward and breach its embankments again, but India has said it has no information on such a situation, which could result in massive floods once again in flood-battered Bihar, as reported by Mint on 22 September. “This (the Kosi issue) is not one of the glowing areas of India’s foreign policy success. When I was in the finance ministry, the World Bank chaps were quite keen to pick up the project (Kosi dam) but the external affairs ministry poured cold water, saying this was a bilateral issue where India and Nepal enjoyed a special relationship and involvement of the World Bank would internationalize the issue," deputy chairman of Bihar’s planning commission N.K. Singh said in an interview published in Mint on 21 September. Due to the topography of Nepal, its rivers have large catchment areas, mostly in India—one reason why the flooding of these rivers affects India more than Nepal. Bihar fears that the recent floods may adversely affect the political fortunes of the Nitish Kumar-led JD(U) government and has been pointing fingers at the Union government.